Shirts With Random Triangles: Urban Meyer describes his first trip to the NFL Draft. Urban Meyer describes his first trip to the NFL Draft. 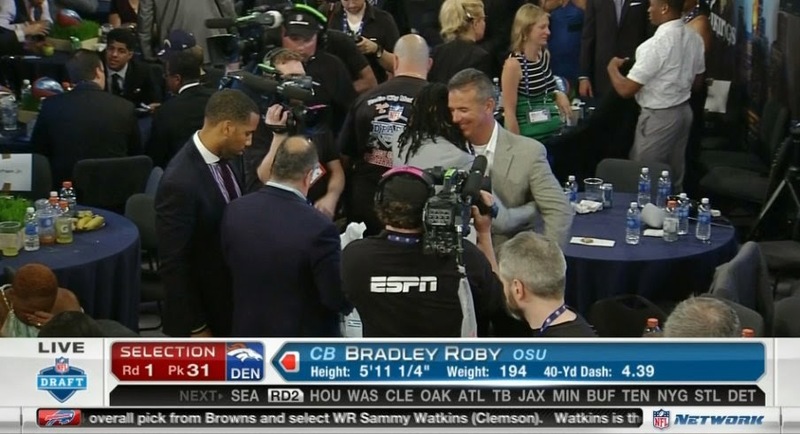 Urban Meyer gets hugged by Bradley Roby at the 2014 NFL Draft. Via Eleven Warriors. May 8 marked another first in the career of Ohio State head coach Urban Meyer. It was the first time Meyer had ever traveled to New York City to attend the NFL Draft in person. According to Meyer, he made the trip to NYC at the insistence of former Ohio St. linebacker Ryan Shazier, who was chosen as the 10th pick in the 2014 NFL Draft by the Pittsburgh Steelers. "I've been invited to the draft every year, whenever I had a first-rounder, which was a lot," Meyer told cleveland.com. "I never went because I always felt like you were taking away from the players. And it's your chance to sit down with your (own) wife and your family for a weekend. "And (Shazier) called me and I said, 'I don't think I'm going.' And he said, 'No, you've got to go.' And I'll never miss it now." Meyer went on to describe the experience of watching one of his players get drafted in person. "It was incredible," Meyer said. "You melt like butter to see Ryan Shazier's mom have that moment, that we're a part of. Game changer. One of the top five things I've ever witnessed in my life. Especially with that kid. You talk about that pure heart now - genuine love and respect for his family. To see that, with his brother it was the four of them - wow." Meyer saw both Shazier and another former Buckeye, cornerback Bradley Roby, drafted back-to-back in the first round of the 2014 NFL Draft. Roby was picked 11th by the Denver Broncos.